Ladies (yes ladies) and Gentlemen, start your facial hair! 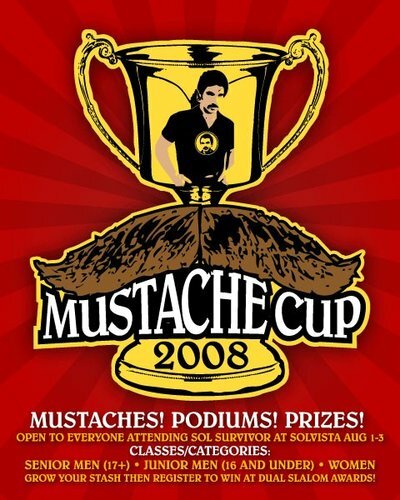 The fellas at the SolVista Bike Park are throwing down a right, proper mustache growing contest, to be held at the Sol Survivor Mountain States Cup race, August 1-3. That's about six weeks to get that upper lip coiffed to perfection.Everyone is eligible for participation in the 1st Annual Mustache Cup. There will be a podium and prizes for the top 'staches in each of three categories: Men 17+, Junior Men 16 & Under, and Women. Registration, display, judging, and the whole sha-bang-a-bang will be held at the Dual Slalom Awards Ceremony at the Sol Survivor, Aug 1-3. Judging criteria is still being worked out, but a combination of staff judging and crowd participation will make sure the most-deserving hairy lip gets the gold. Please feel free to steal the cr@p out of the poster image and circulate it to as many 'Stashers as you see fit. This awesome contest and poster are the brain-child of hyper-talented graphic artist Evan Chute. Give him your praise, your business...and your razors. Visit www.bikesolvista.com and www.racemsc.com for information on the venues and races. Yes, that IS a picture of John Oates (of Hall and Oates) wearing a Magnum P.I. shirt. love to the women's class - would be great fun! ooh la la chicks with mustaches.... i gues thats cool?